I love hot pink & red together. I have actually been searching for a dress similar to this, but I have been unsuccessful in finding one I like. So I decided to put it together myself! This skirt is one of my favorites. 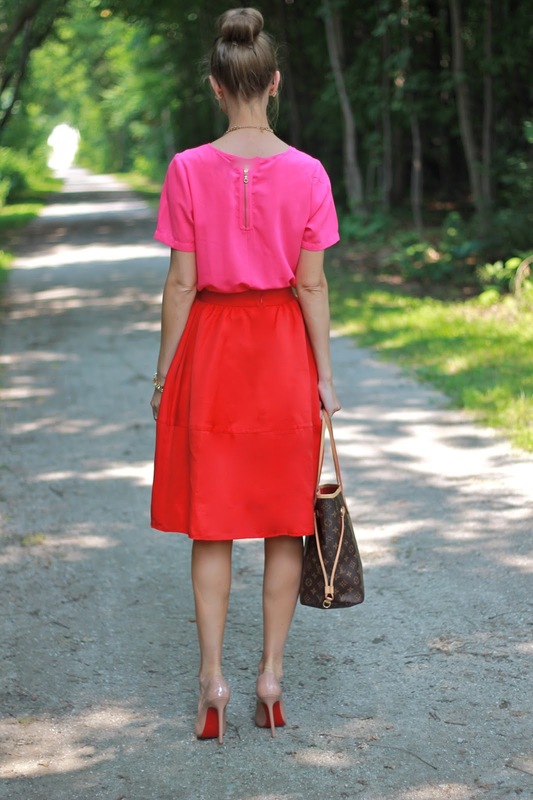 I love a good midi skirt. Because I am so tall, I find that it is so much easier for me to order midi skirts/dresses online than other skirts or dresses because I always worry they will be too short. I love that a skirt like this can be dressed up for a special event or dressed down for work or a more casual gathering/dinner. With the hot summer days we have been having lately, a bun is definitely my go-to. I love curling my hair or wearing it straight but with the heat and humidity my curls last about 10 minutes and my straight hair has me sweating. Surprisingly I still get compliments on my sock bun when I wear it (which seems crazy to me since I wear it almost every day during the school year-ha!). Thanks for reading!